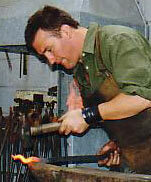 James Kendrew is an apprentice trained blacksmith. Since setting up his own workshop in 1988 he has made traditional and contemporary ironwork to suit a variety of environments and all budgets. His work as a blacksmith is to forge hot metal. "To forge" is to manipulate by hammering, squeezing, bending, twisting and shaping hot metals. When hot (between cherry red and white) steel becomes formable much like plasticine and the job of the blacksmith is to take the raw material and make a functional item that works and looks aesthetically pleasing. Forging is an age old craft, pottery may have took humans forward in cooking and storage but it was the early blacksmiths who made the tools for construction and agriculture. Every metal item throughout history was made by blacksmiths - from the first axe to the first clock. 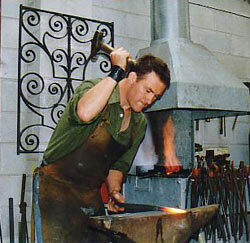 James's skill as a blacksmith is well known and the BBC filmed James in the early 90's as part of the documentary The Birth of Europe. Dressed as a blacksmith of the early 1700's and working at the Finch Foundry, an historic foundry near Okehampton, James was filmed producing a hand tool from start to finish. 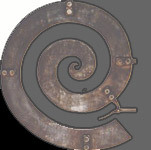 Techniques in forging have not changed at the most basic hammer and anvil level but design and customers ideas and the uses for metalwork make this a very exciting time to be a blacksmith. James in his work shows off the skills involved in working hot metal, the shapes that can be achieved are limitless and allied to this is the wonderful surface texture of forged metal. James Kendrew is indeed very proud of his place as a true craftsman in these modern times.